A Massachusetts Child Custody Lawyer is a legal professional aligned with family law; a Massachusetts Child Custody Lawyer is experienced in litigating over child custody issues in accordance with the state’s multifarious laws. Going through dissolution of marriage or leaving an abusive relationship is often difficult; your life is invariably disrupted and if you have children, their lives are affected as well. If you have children, the financial, legal and emotional concerns are complex—the purpose of this article is to provide information concerning Massachusetts’s child custody laws and the most effective means to hire a Massachusetts child custody lawyer. The majority of custody and visitation decisions in the state of Massachusetts are rendered by judges of the Probate and Family Court. These decisions may be part of a larger case, such as a divorce filing, or the case may be solely evaluating the custody or visitation concerns of the filing parties. Furthermore, district courts and the Boston Municipal Court will also handle cases to render custody orders. Sole Legal Custody: Occurs when one parent is awarded the right and responsibility to make major decisions regarding the child’s life and welfare, including the child’s education, medical care, as well as, moral, emotional and religious development. Shared Legal Custody: Means the parents share a continued responsibility in major decisions regarding the child’s welfare, including matters of medical care, education and moral, religious and emotional development. Sole Physical Custody: Means that the child will reside with and is under the direct supervision of one parent involved in a child custody hearing. This type of custody; however, is subject to reasonable visitation by the other parent involved, unless the judge believes that such visitation is not in the best interest of the child. Shared Physical Custody: Occurs when a child splits time with and being under the direct supervision of each parent. Physical custody is shared by both parents in a way that assures the child maintains frequent contact with both parents. If you do not hire a Massachusetts child custody lawyer and you have recently left your spouse, you must understand the state’s rules regarding custody issues without the inclusion of a court system. When the parents are married, they will share legal and physical custody of the child unless the judge orders otherwise. When the parents undergo dissolution of marriage, the mother will maintain sole legal and physical custody until the case is brought to court. If have recently ended a relationship with your child’s mother or father, you must contact a Massachusetts Child Custody lawyer to illuminate your options. If your situation can be handled without the inclusion of a Massachusetts Child Custody Lawyer (if you and your former loved one or spouse can respectfully and cordially develop a visitation schedule) you should avoid the fees associated with legal help and attempt to carry-out the agreement. If an agreement cannot be reached between you and your ex, you should contact a Massachusetts child custody lawyer if you feel that your custody are not reasonable or have been infringed. In a Massachusetts child custody case, the court will award custody based on what it views as the “best interests of the child.” The best of interests of the child standard requires the court system to focus on the youth’s needs—the parents standing or emotional wants are not accounted for in the standard. The law thus requires the courts to render custody decisions by awarding custody to the parent whom it views is the best party to meet the child’s needs. •	If married parents initiate divorce or a custody proceeding, they will automatically have temporary shared legal custody of the child, but the court may award temporary sole custody one of the parents if shared legal custody is not in the best interest of the youth. 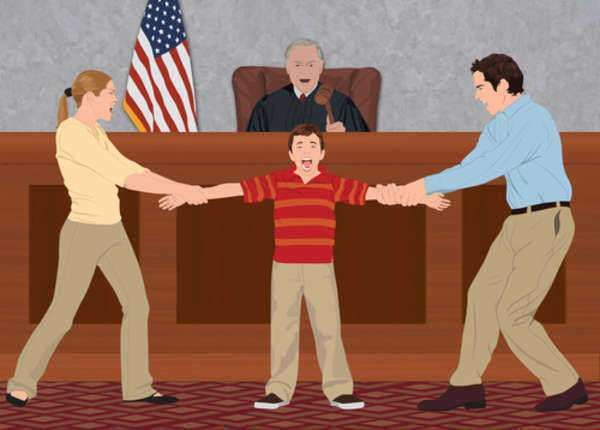 •	If the court is rendering a decision regarding temporary shared legal custody it will consider all relevant facts including: whether a family member abuses drugs or alcohol or has deserted the youth and whether the parents have a history of being willing and able to cooperate in matters concerning the child and his or her welfare. •	The state’s law says that when issuing a custody order, the court system must consider evidence of abuse toward a parent or the youth as a primary factor against the best interests of the child. If the court affirms a pattern of abuse, rebuttable presumption is present that is not in the best interest of the youth to be placed in a physical, sole legal, shared legal or shared physical custody with the abusing party. •	For children born to an unmarried couple, the mother will automatically be awarded with custody unless a state family court rules otherwise. A Massachusetts Probate and Family court can awarded shared physical or shared legal custody only if the parents agree or if the state finds that the parents have exercised a successful joint responsibility agreement prior to the filing of the case—the court must be convinced that the couple has a suitable plan and is able to communicate with each other concerning the youth’s best interests. •	In most cases, when one parent is awarded physical custody, the other parent will secure visitation with the children. The court will construct visitation schedules based on the parents’ wishes and the ability of the Massachusetts child custody lawyer—a Massachusetts custody lawyer will have the ability to secure a favorable visitation schedule for their client.